I have no data to verify this, but it seems like native corn varies from year to year. Some years are better than others. 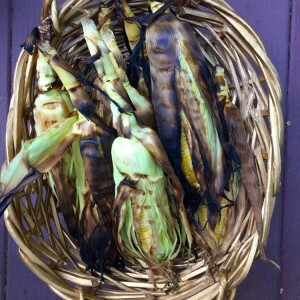 This season, without a doubt, the native Connecticut corn is absolutely spectacular. Several days a week, I stop at Jake’s farm stand in Madison, and buy as much corn as I can eat. Once home, I remove the silk, peel back a few outer leaves and then toss onto the grill. It’s the best way to get that nutty, the caramelized flavor which comes when the kernels get nice and brown. What pleasure to peel back the husk and inhale the aroma! A little butter and salt and I’m ready to enjoy this most perfect summer delight.